"If you sleep with a snorer, you are going to love the Smart Nora!" - Oprah, December issue of O, The Oprah Magazine. WHY AM I SELLING THIS? My husband suddenly started snoring like a freakin' train, every dang night. I simply could not sleep in the same room and it was creating fights between us, and awful, sleepy days for us both. Finally saved up to afford this beauty, and immediately he stopped. If he forgot to turn it on, he snored and I woke up and left the room. If he used it -- a great night's sleep. Long story shorter... 2 weeks later he got a sleep apnea assessment he'd been on standby for and it turned out he has had SEVERE apnea for his whole life and the snoring was just a new symptom... a CPAP was brought home that night. Nora has not been used since. Meet Smart Nora, the first and most comfortable contact-free snoring solution that's designed specifically to stop snoring before it wakes your sleeping partner. With Nora, there's nothing to wear to bed—no masks, dentures, or nose strips. 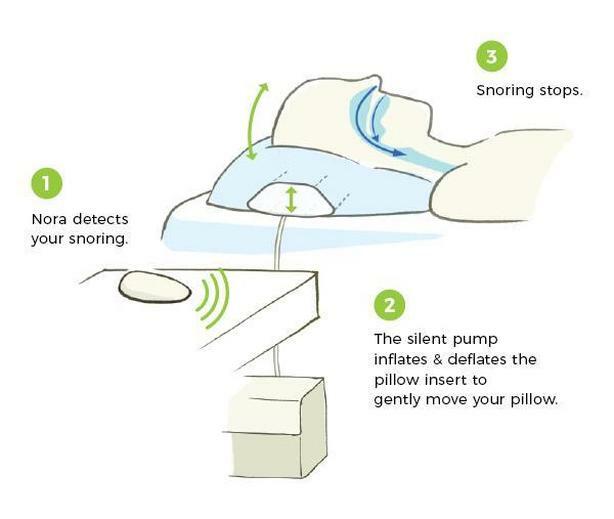 Smart Nora reduces snoring with a gentle motion, your favourite pillow and in any position. CONTACT-FREE AND COMFORTABLE. - Reduces your snoring without compromising your comfort. Invented by a snorer, Smart Nora doesn't sacrifice the sleep of the snorer or their partner after the first few nights. KEEP YOUR FAVORITE PILLOW, SLEEP IN ANY POSITION. - Smart Nora works with soft, firm, down, memory foam, or any other pillow on the market. The unique design allows you to sleep on your side, back or stomach. LOVED BY THOUSANDS OF COUPLES. - Our solution has helped more than 30,000 couples in United States and around the world to sleep peacefully in the same bedroom. CUSTOMIZABLE TO YOUR BEDROOM. - Adjust sensitivity level of the microphone, amount of motion in your pillow and the 30-minute delay, to find your optimal setting. For best results, during the first two weeks customize Smart Nora to your bedroom environment and use the overhead mount.